Sunday, December 8 1907 -- The inaugural running of Santa Anita is now in the history books, and Herriman contributes two full page-width pieces on the event to the Sunday paper. After idly coming up with a few ideas for funny greeting cards while on vacation, Barbara and Jim Dale started a greeting card company out of their home in 1979 with a line that featured modern, sassy humor. Barbara was responsible for the simple but effective art, while she and Jim both worked up the gags. They initially handled sales and marketing themselves, but the line did so well that by 1981 they sold off the business end of the card line to Recycled Paper, a publisher of 'alternative' cards. The market for snarky, biting humor in greeting cards was exploding at this time, and companies like Recycled were giving the old fuddy-duddy Hallmark-style cards a run for their money. Barbara and Jim were riding that wave, churning out new card ideas at breakneck pace to keep up with demand. For every gag that lent itself to greeting cards, Barbara and Jim came up with and filed away dozens that didn't really work in that application. 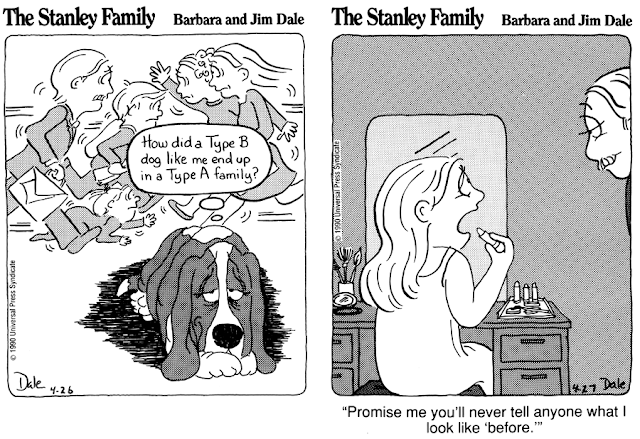 Thus came about a few cartoon books, and, in 1990, a feature for Universal Press Syndicate titled The Stanley Family. 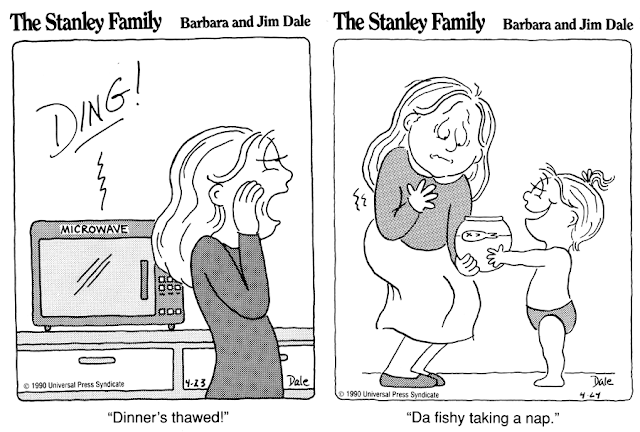 The daily panel and Sunday strip featured the now-familiar Dale look and humor. I don't know if the market for the Dale style had cooled by 1990, or if there was a glut of similar material on the market, or the panel was a tad too edgy, or even if perhaps marital problems were to blame (Barbara is a single act these days) but for some reason the feature hit the newspaper market with a dull thud. Marketing claims that the feature ran in about 70 papers are undoubtedly rose-colored, I'd guess more like 20-30 actually ran it. The feature debuted on April 2 1990 and, as best I can tell, didn't even make it to the end of a one-year contract. The latest I've found it running is February 17 1991. The Pittsburgh Post-Gazette carried the Stanley Family in March 1991, so it did run later than Feb. 17 that year. Thank you for that Henkster. Sounds, then, like it probably did make it through the full year of a contract. Next time I have access to microfilm of the PPG I'll get a better end date. I ended the panel after about a year and a half because I didn't like doing it and I felt like I was doing better work in licensing. It was a hard decision because I knew I may never be syndicated again. But, I'm interested in all kinds of genres. I spent years painting and printmaking Right now, I'm writing a novel. Thanks so much for your interest in my work. 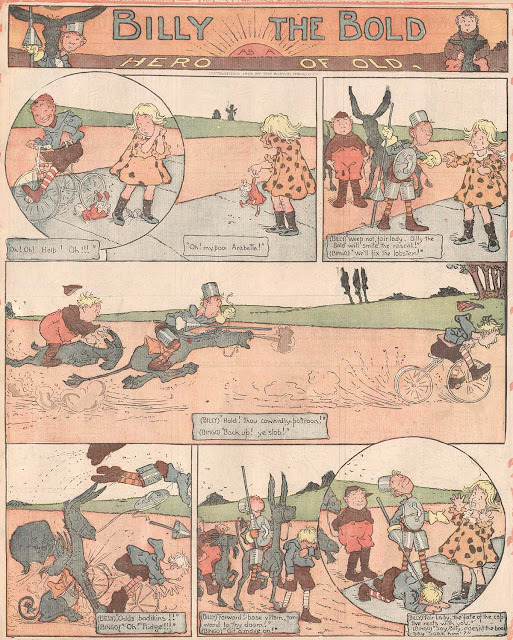 Billy the Bold as a Hero of Old ran in the third and last incarnation of the Boston Herald's homegrown Sunday section from September 2 to November 4 1906. It's a cute strip about a kid who fancies himself a knight and brings evil-doers to justice atop his donkey 'steed', accompanied by his faithful companion Bingo, who rides a goat. 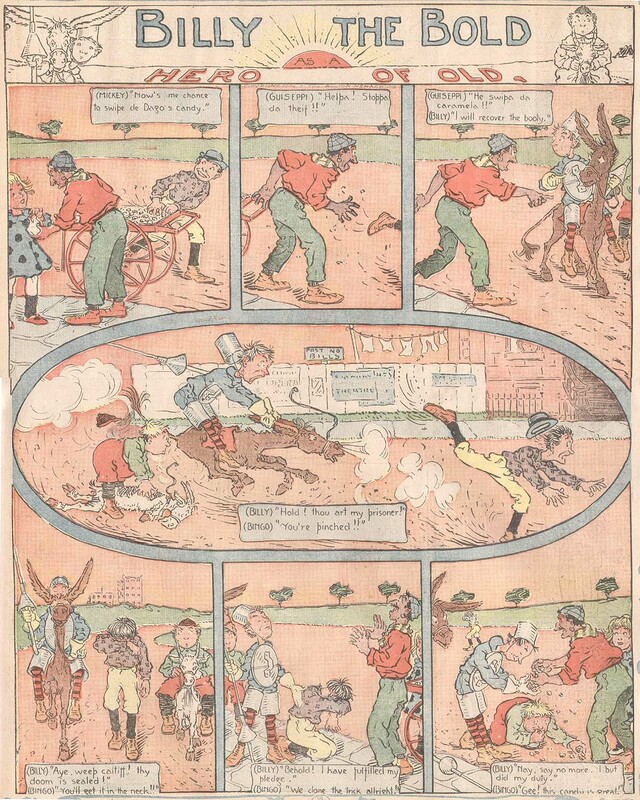 The strip is a bit old-fashioned, even for 1906, with the dialogue running as captions under the art. There's a mystery here -- who did this strip? The art was never once signed, but the style is definitely familiar to me. I've held this obscurity back from the blog for many months, figuring that the answer would eventually come to me. No such luck though. Hopefully one of you blog readers can come to the rescue and supply the answer. It is a parody of Don Quixote, the hero of Miguel Cervantes great novel, the old chevalier who set out to fight injustice dressed in ragtag armour and a lance on a tired old horse, with his fat compadre, Sancho Panza,who rode a mule. Hello, Allan-----My guess as to the artist on BILLY THE BOLD is Walter J. Enright. ----Cole Johnson. I see where you get that, but it's certainly not the "Oh, of course!" moment I was expecting. In fact I don't really know much of what Enright was up to in the mid-oughts. From the little pieces I can Google it sounds like he was pretty heavily into book illustration at the time. If he was a 'name' artist, wouldn't the Herald have given him a byline? Howdy Doody came to television in 1947 and quickly made neighborhood heroes of kids who were lucky enough to have a TV set. By the fifties kids watched the show religiously and begged their parents to buy all the marketing paraphernalia it spawned. A comic strip seemed like a natural outgrowth of the series and its marketing plan, sure to make kids whine until pops switched Sunday papers to the one that carried 'Howdy'. United Feature Syndicate got the nod for producing the strip, which debuted on October 15 1950, but the strip didn't sell nearly as well as one might expect. Credits on the strip are confusing (at least to me, no expert on things Doody). 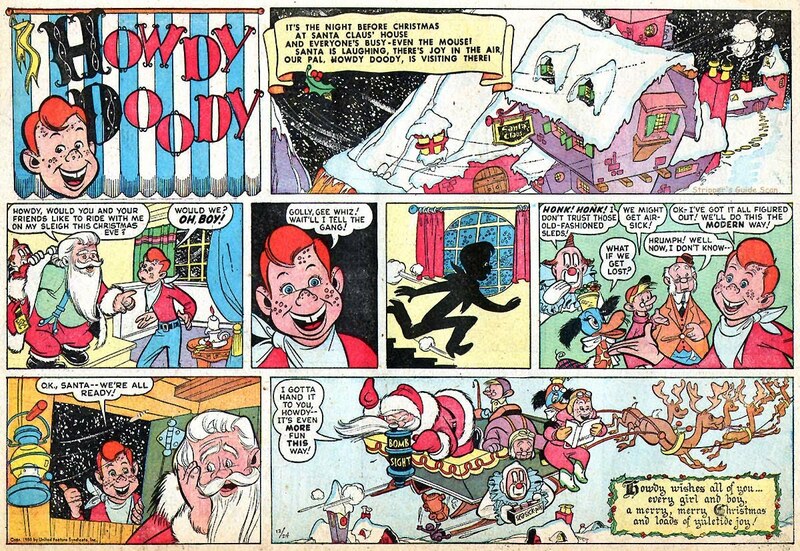 Some websites give Disney alum Milt Neil credit as the creator of Howdy Doody, others say he just designed marketing materials. In any case, when the strip began he was given credit along with Chad Grothkopf. To my eye the art throughout the series looks to be Chad's. Neil's credit (for writing?) only lasted until December 3. Then Chad got sole credit until January 7 1951 when someone named Lee took a share. Lee got a credit on just three Sundays, then Chad once again stood alone. Then on April 15 a new credit was added for someone named Kean. The team of Chad and Kean were credited through the remainder of the run which ended on June 21 1953. A mere two and a half year comic strip run for this popular TV character seems strange, but then the strip didn't seem to have all that much life to it. The drawing is excellent but the writing is flat and certainly not full of the energy that characterized the TV show. This seeming comic strip natural came and went without much notice. My understanding (from Jerry Bails' Who's Who and Lieffer and Wares' Comic strip Project) is that the Lee is the Famous Stan Lee of Marvel comics. I would think that the Kean is Edward Kean, head writer of the Howdy Doody Show. Kean died last month. Wow! You know when the strip was written in the Atomic Age when Howdy Doody tells Santa to drop the presents from his sleigh like A-Bombs, saying it's the modern way of doing things! Santa even calls it fun! What a piece of history! Is there any confirmation from Stan Lee on that? He was working on My Friend Irma for LA Mirror at the time, seems just slightly odd that he would do a sub job for another syndicate and receive a credit for it. Allan, I wrote a comment about the Stan Lee thing, which did not appear. So let's try again. No new information from me, ddd is right to say the source of this is Jerry Bails. Since I have written about Stan Lee's writing career outside of superheroes and am still collecting informationabout the subject, I would love to see these strips. Too bad it's only three. Are there any dailies as well? Usually it is very easy to recognize Lee's style. There is a new book on Lee in the making; I'll ask Roy and Dany to see what they can find out. In the Marvel house fanzine Foom #17 (March, 1977), and reprinted in Stan Lee Conversations (2007), Stan Lee in the interview, after discussing his various comic strips (but not My Friend Irma), gets on the topic of his ghosting western and detective radio shows and some tv shows. And then... "I ghosted newspaper comic strips. 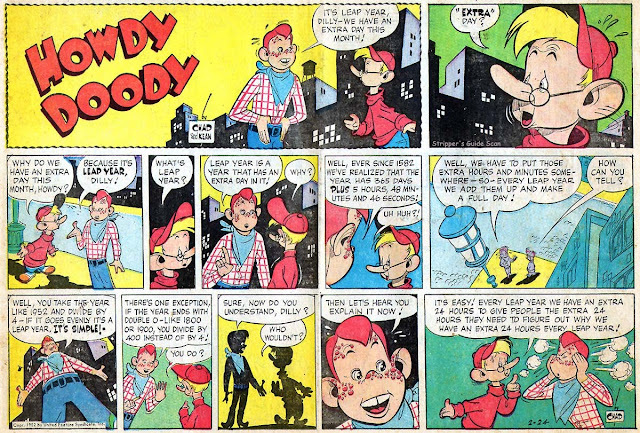 I wrote the Howdy Doody newspaper strip, which I was able to put my name on." Maybe he dropped signing his name on Howdy because after (rumor has it) ghosting Irma he was able to get a credit on that. Taking the Irma credit and continue ghosting Howdy? Lee had worked with and edited Grothkopf in 1941-42 at Marvel Comics and supposedly ghost wrote Grothkopf's contribution to Bell's Fast Fiction - the "Under Two Flags" adaptation. Fair nuff, DD, Stan Lee gets his credit on HD! I also had no idea about him writing Under Two Flags for the "Famous Fiction" strip. More good stuff! Just dropping a line to say that "Kean" was Edward Kean (1925-2010), the main writer on the Howdy Doody TV show. Kean also wrote several HD Little Golden Books and Tell-a-Tales from 1950-55. As for Stan Lee, I very much doubt if he might have actually written the HD page, even just for three weeks. Per comments posted on Amazon a DVD set includes " a remarkable show with Milt Neil the cartoonist on the Howdy Doody comic strip doing team-up drawings with a fellow artist where Milt does one side of a character's head at the same time the other artist does the other side of the head, resulting in a perfectly balanced drawing that looks like the work of one artist". That sure makes it sound like Neil was mostly on the drawing team along with Chad Grothkopf (the "other artist". So maybe Kean wrote from the start with lee pitching in when needed and credits for writing only added belatedly? 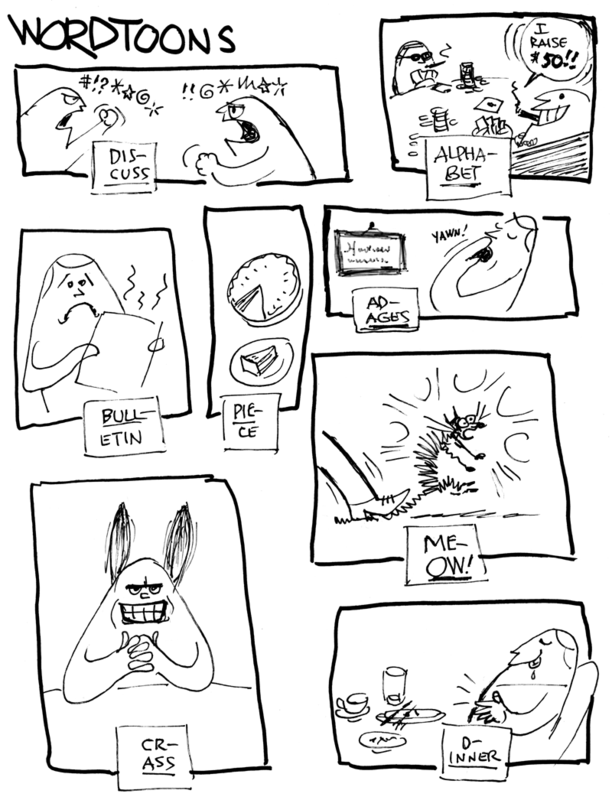 I added the question as a sideline, but from all the surces I still can't get the information if this was a Sunday only strip or if there was a daily version as well. I am updating the Stan Lee bio for the GCD in his creator entry, and I noticed the Stan Lee credit, posted by Ger and confirmed by Stan via D.D. posting here, wasn't updated in the book, which is a shame. I hope it gets updated in any future edition. Hi Ray -- That would take some help from Doctor Who, since the data for the book was put to bed in 2009, and these credits only started to be discussed here in 2010.